The game is fun. This isn't questioned here. However, there is a rather long laundry list of improvements that this title could have withstood. Some of them can be answered by its status as a console port, while other problems are just a result of asinine design. First off is the control scheme. It was originally designed around the Dreamcast controller, and that in turn was adapted to the mouse. While Activision went ahead and included some keyboard hotkey support, the primary problems lie with automatic camera focus and group unit selection. If I click on Nell's unit portrait, the camera automatically centers on her and her surrounding units. If I'm trying to send Nell, Jelky, and Ana to the same point, I have to click, scroll, right-click, click, scroll, remember where I last right-clicked, do it again, etc. It's horrible. It makes things even messier in group battles. For instance, if you're trying to have Larf switch targets, you can click on him or one of his soldiers to do it, and then right-click on the new target, but since Larf's soldiers are likely to be interspersed with, say, Deamond's, you might repeatedly click on one of Deamond's cavalry instead of Larf's dragon cavalry. Continuing on, let's say Larf gets killed and leaves behind six or seven dragon cavalry in battle. Your natural tendency is to revive Larf at the Headquarters and send him to a barracks or right back in to battle. If you do this, however, the game will interpret the command given to Larf as being issued to all his troops, including his recently bereaved troops. Meaning that they will suddenly ignore their targets and run back to wherever you just clicked. 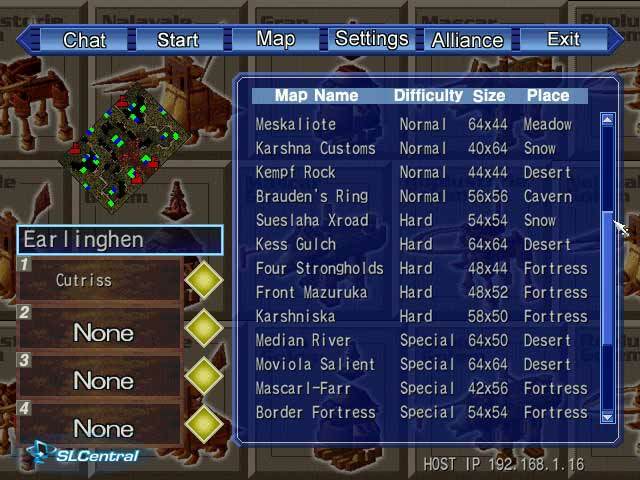 Worst of all, you can't group-select commanders. This would help alleviate the problem with assigning multiple units to a particular location, but it makes for a lot of pain and bother when trying to send multiple forces down a path, or have everyone concentrate on a single building in an attack. Of course, this perhaps could have been the intention of the developers, since your forces will frequently trip over each other trying to get to the same destination. It's ironic that while the game's main emphasis is on army management versus unit management, you frequently have trouble with this as two or three commanders' units will be mixed up, preventing one from moving past the other. The pathing AI, already noted to be relatively awful, doesn't account for your own soldiers trying to move past each other. If you order some infantry off down a path, and send some cavalry down after them, expect the cavalry to get there at about the same time, since they won't be able to easily make it past the slow moving infantry. Finally, there's the issue of multiplayer. I couldn't easily test this, because Activision didn't make it very easy to test it. 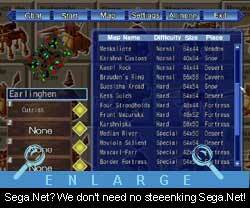 In Japan, Dreamcast owners could play Hundred Swords on Sega.Net using a matchmaking service - No such service exists for Hundred Swords. It's direct LAN or TCP/IP only. Ordinarily, that's not so bad - Look at what Quake 2 did with direct LAN or TCP/IP only. On the other hand, Quake 2 sold thousands of copies and was a smash hit. Hundred Swords is a low-key release on Sega's part, and will likely pass under most gamers' radar. It's not known yet whether PC gamers will be able to compete against PS2 gamers with the upcoming PS2 release of Hundred Swords, nor is it even known if the PS2 port will have online playability, given the current status of Sony's online network rollout.